What do Kerry and McCain know about Libya that we don’t? At whowhatwhy.org, we’ve been saying for some time that things just don’t add up when it comes to Libya. (For some of our past reporting, see for example this and this and this.) First the White House claimed that NATO needed to engage in a few days of bombing in order to protect Libyan civilians from Muammar Qaddafi’s troops. Those few days have turned into three months, and protecting civilians has morphed into a massive and unrelenting bombing campaign. But what national security interests? Those have never been spelled out. Kerry and McCain, according to McClatchy Newspapers, aren’t saying. Shortsighted and dangerous for our country? How so? Kerry says just enough that it’s clear he knows something we don’t. Whatever it is, it has nothing to do with the principally humanitarian objectives originally cited for the bombing campaign. But that’s not what matters. 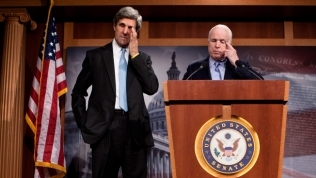 What matters is that Kerry and McCain, 2004 and 2008 presidential nominees of opposing political parties, know something that makes them back Barack Obama in committing heavy resources to the job of removing Qaddafi. This is, among other things, ample grounds for concern about the range of permissible views within the elite policy circles of both parties. Readers of this website and of my book, Family of Secrets, understand that the US government rarely levels with the American public on the real reasons for strategic policy decisions. In this case, the phrasing used by Kerry and McCain make clear that Libya has “national security” implications for the United States—implications that they so far will not lay out. We’ve talked about what those implications are likely to be. It is clear that, in light of the still-unfolding Arab Spring and the destabilization of cooperative regimes, strategically located and oil-rich Libya simply must be brought into the US camp. It is the ideal new anchor for long-term future US military operations in the region designed to secure continued access to oil supplies. The administration cannot simply explain to Americans (and, hence, to the world) that it feels justified in military action to protect the vital flow of oil. So it has to be oblique. Meanwhile, those apparently excluded from the inner sanctum take a position that, on the surface, seems more logical and responsible, given that the White House estimates the Libyan campaign will have cost a staggering $1.1 billion by Sept. 30. “Our members are frustrated over the president’s action, his lack of positing a clear vision and mission,” he said. Discussions were under way on possible House action, including denying funds for the operation as part of a defense-spending bill that’s expected to be considered beginning Thursday. In another development Tuesday, the Treasury Department took new steps to isolate the Libyan regime and provide incentives for its members to pitch down. So Kerry and McCain understand what is at stake and what is expected of them. Meanwhile, we continue to be amazed by how the news media is missing the whole story.